How fast can evolution operate? Creationists often argue that evolution is "only a theory" [Miller2008]. This claim of course confuses the vernacular meaning of "theory" (a half-baked conjecture that has not been seriously tested) with the scientific meaning of "theory" (a solid, falsifiable hypothesis that has led to a rich literature of quantitative, empirical science). Behind the creationists' comment is the presumption that significant changes have never been observed over human-scale time periods, so evolution must be regarded only as a "theory." In a similar vein, some creationist writers argue that evolution cannot occur on short time scales, so that existing evolutionary theory cannot explain the sudden emergence of new features, new species, or other abrupt changes that are observed in the geological record. They also often dismiss instances of present-day evolution [Ham2017]. Antiobiotic-resistant diseases. Perhaps the best-known examples are the recent evolution of new strains of tuberculosis that are resistant to all known anti-TB drugs. By analyzing DNA sequences, researchers have identified at least six different families of tuberculosis, at least one of which appears to be evolving on an unexpected and potentially very dangerous path [Lehrman2013]. Another example is the announcement on 27 May 2016 that a Pennsylvania woman, who was diagnosed with a urinary tract infection, was in fact infected with a strain of bacteria that was resistant to colistin, an antibiotic "of last resort" -- used only when all other antibiotics have failed. This was the first instance of this strain in the U.S. More are feared [Moyer2016]. Tibetan high-altitude genes. In 2010, researchers at the University of Utah and Qinghai University in China have found that natives of the Tibetan highlands have evolved ten unique genes that permit them to live well at very high altitudes. Because of these genes, Tibetans have more efficient metabolisms, do not overproduce red blood cells in response to thin air, and have higher levels of nitric oxide, which helps get oxygen to tissue [SD2010b]. A even more recent study found a total of 30 genes that were distinct in the Tibetan population, and concluded that this change constitutes the fastest documented case of human evolution [Wade2010b]. Hawaiian crickets. In the 1800s, a species of cricket was introduced to the Hawaiian Islands, where they became quite common in grassy areas. Males attract mates with their chirps, and females select males based on their songs. However, unlike their counterparts in other Pacific islands, the Hawaiian crickets have a fearsome predator -- dive-bombing flies that target chirping crickets, then implant their larvae in them. In the 1990s, researchers noted that a field in Kauai that previously was the home to many crickets now seemed silent. However, a nighttime search found that in fact there were lots of crickets there, but very few of the males now chirped -- in just five years, or roughly 20 generations, a mutation had arisen in a single gene that inhibited many of the males from chirping [Zuk2013, pg. 81-82]. 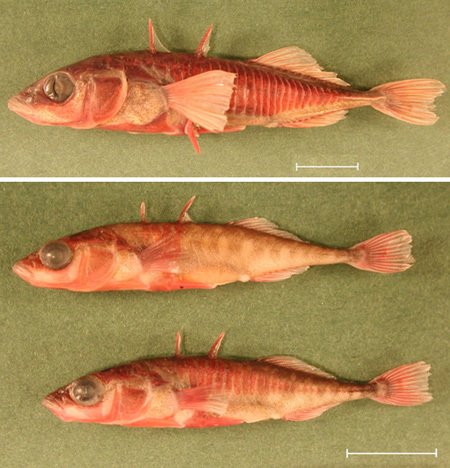 Stickleback fish in Switzerland. 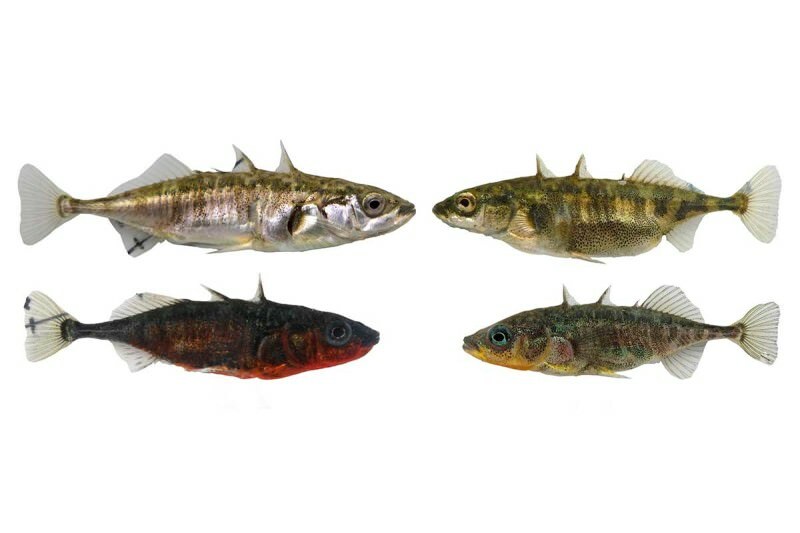 In yet another example of speciation of stickleback fish, researchers at the University of Bern have found that a population of these fish in Switzerland's Lake Constance, which was only introduced roughly 150 years ago, appears to have split into two species -- one lives in the main lake, and the other lives in streams flowing into the lake. The lake fish are generally larger, and have longer spines and tougher armor -- see photos below (on the New Scientist website, copyright David Marques). The researchers confirmed that it was speciation, not just lifestyle, by noting clear genetic differences between the two populations [LePage2016]. New York City fauna. In 2011 researchers at the New York University Medical center noted that tomcod in the Hudson River appeared to have acquired resistance to PCBs, which otherwise cause deformities in fish larvae. As it turns out, almost all of these fish share a mutation known as AHR2, which inhibits PCB action and thus shields the fish from harm. This mutation is completely missing from tomcod that live in northern New England and Canada. In a similar vein, researchers at the City University of New York recently identified a set of mutations spanning more than 1000 genes that are present in all white-footed mice in New York City, but which are missing from mice in Harriman State Park, just 45 miles north. Many of these genes are involved in fighting bacteria, while others appear to aid in coping with exposure to chemicals [Zimmer2011]. Urban birds. Many formerly wild birds have taken up residence in large cities, and at least some are now quite different than their native equivalents in forests. They typically have stockier bills, sing at a higher pitch (to overcome street noise), tend not migrate and appear to have slightly less tense personalities [Schilthuizen2016]. Spiders in Vienna. Spiders in Vienna, Austria have evolved to build webs near streetlights, in order to trap insects drawn to these streetlights. In response, some urban moths have developed an aversion to street lights [Schilthuizen2016]. Tasmanian devils. Tasmanian devils, a rodent-like creature with impressive fangs, have been seriously threatened by an unusual cancer, namely "facial tumor disease," which is typically transmitted when one individual bites an infected animal. The condition, first observed in 1996, has caused the devil population to plummet by roughly 80% overall, 95% in certain locations. Now genomic analysis has confirmed that a gene has arisen that confers partial immunity, and in only ten generation has spread very widely in the population [Klein2016]. In summary, numerous examples of true evolutionary novelty can be cited in the scientific literature. What's more, many of these examples have been documented as occurring within just a few days, years or decades (i.e., within a human lifetime), or, in the case of the Tibetan high-altitude genetic changes, in the scope of only 200 or so human generations. The message is clear: when environmental pressures are sufficiently strong, evolution can truly happen "in a flash." Thus the claims by creationists and intelligent design writers that evolution cannot produce anything truly new, or that it operates too slowly, have been rather soundly refuted. For additional details and discussion, see Novelty and Speciation.